A total of almost 32,000 J40s were produced from 1950 to 1971. 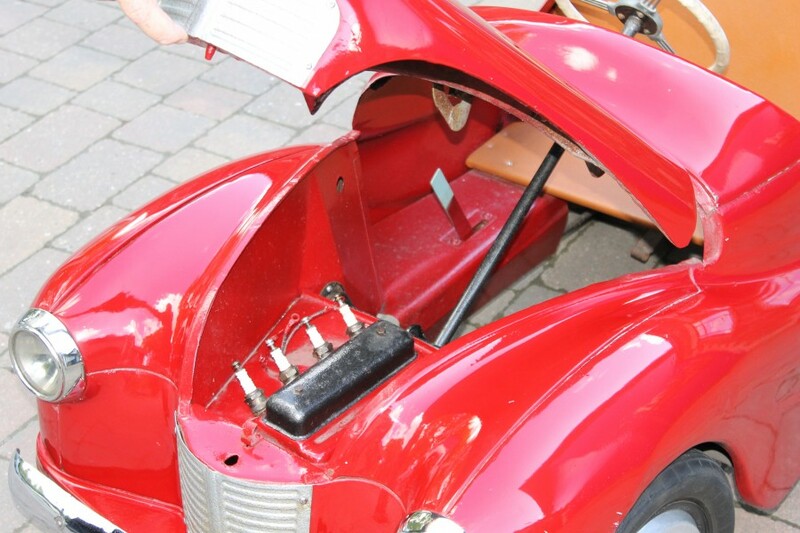 They were made using off-cuts of metal supplied by Austin’s Longbridge factory. 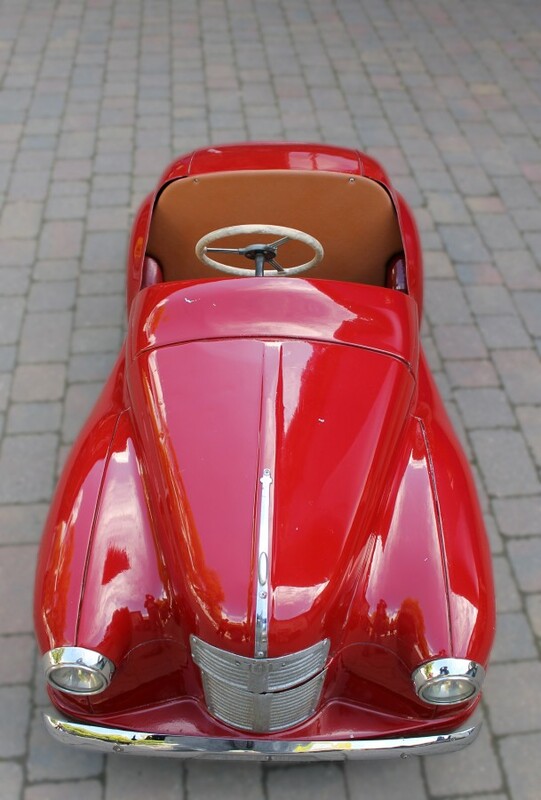 Although the model was labelled ‘Junior’ in sales catalogues they were know an ‘Joycars’ by the Austin factory and came with a dummy engine, complete with spark plugs and leads, battery operated headlamps, horn and chrome trim. 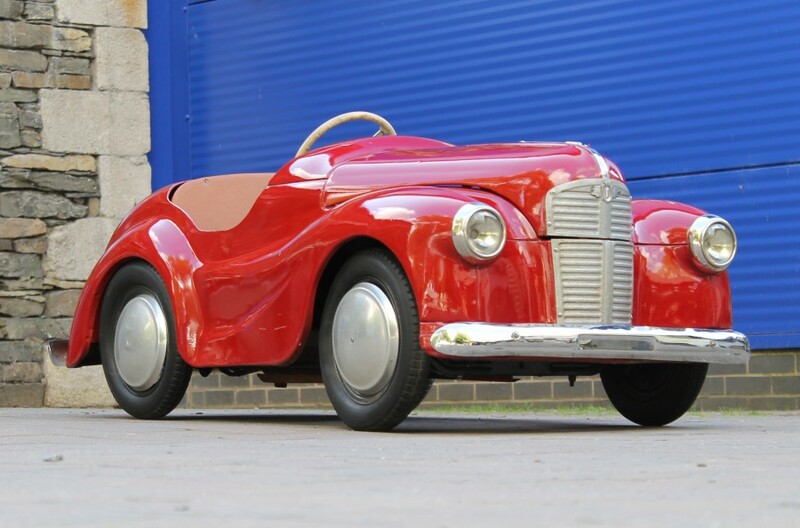 Although production of the Austin Joy pedal cars started in 1949, the story starts in 1946 when Sir Leonard Lord conceived the idea of a factory which could employ ex-miners suffering from Pneumoconiosis to build Austin pedal cars. He intended it to be a non-profit making concern and purely for the purpose of employing disabled miners at Bargoed, South Wales – a high unemployment area. 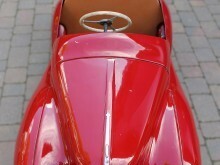 Sir Leonard employed Ron Phillips, a commercial artist and Jim Blaikie, a planning draughtsman to design the pedal car. 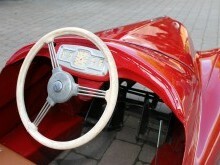 Various schemes were produced, and Alf Ash from the Sheet Metal Department advised on detail. He measured his two year old daughter and the car was designed to fit her. Bill Avery and Jack Turton, two panel beaters, built the prototype in sheet steam. 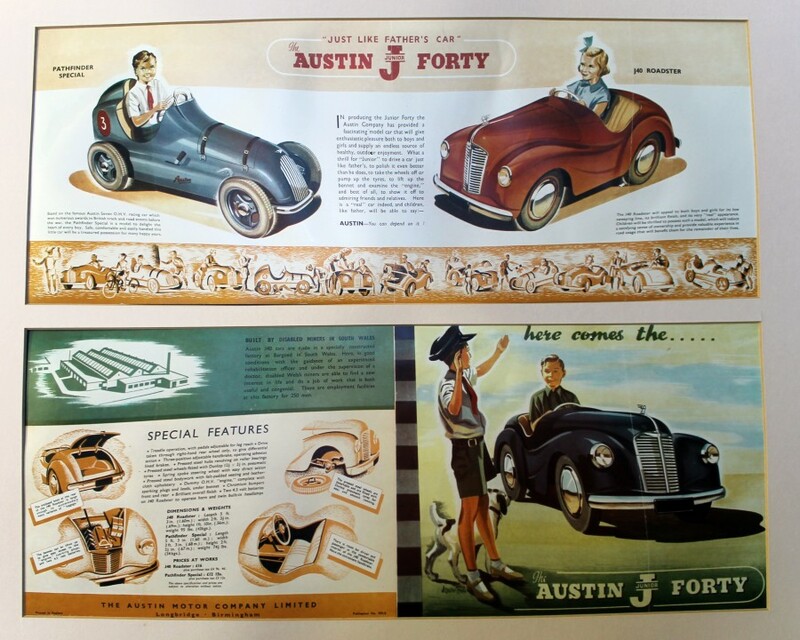 It was designed to show the maroon prototype at the 1,000,000 Austin Car Show in 1946 and it was based on the Austin 8 and 10 in the same era. The Works Manager of Longbridge, Sir George Harrison, suggested that the prototype carry the number ‘JOY 1’ and subsequently they would be known as ‘JOY CARS’. 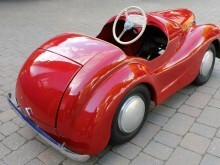 ‘JOY 2’ was eventually produced in 1946 with the assistance of Jack Finish from the Drawing Office and subsequent models were similar with a lower bonnet line. The troublesome chain drive was dropped in favour a treadle action and detachable wheel were introduced. The Joy 2 was tested by various families and after each test was stripped for wear and eventually the colour changed to green. 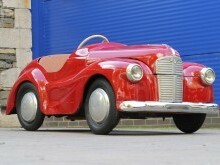 In 1948 a wooden mock-up was made of the J2, incorporating a Devon front end, which proved very ugly. 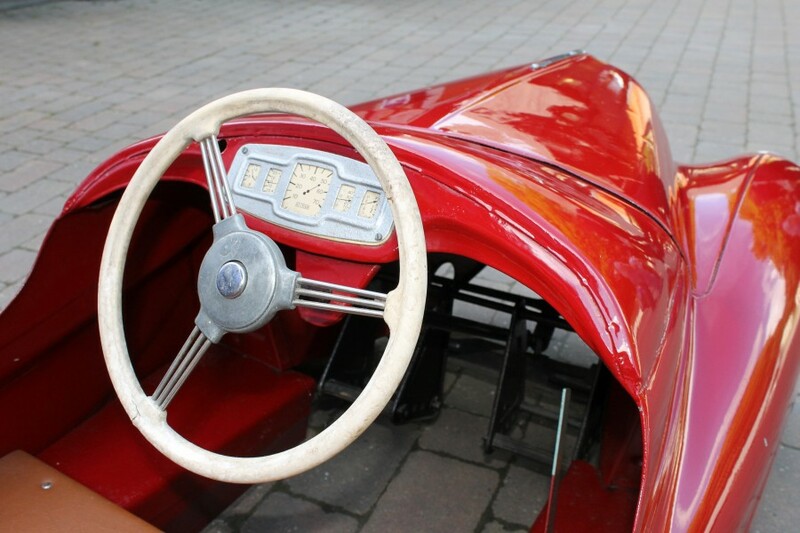 In the same year, the Joy 2 was followed by Joy 3 pathfinder, which was based on the Jamieson OHV 750 Austin Seven racing car of the 30s and a white prototype was produced. Technical problems were eventually resolved and resulted in a more attraction and efficient ‘JOY4’. 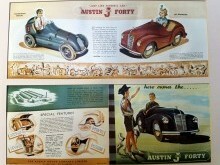 The factory opened on the 5th July, 1949, and was called the ‘Austin Junior Car Factory’. The manager was Mr G H Farrar and it was paid for by government funds. Production started with the Pathfinder and it was intended to build 250 a week, but this figure was never reached. One prototype built became the J40 Roadster and was different from production models with a different steering wheel and no panel joints . It was metallic steel blue in colour. So four prototypes were built and one wooden mock-up. After a year the Pathfinder was dropped and replaced in 1950 by the J40. 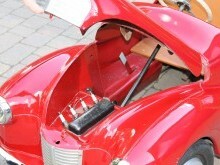 The cars were made from scrap off-cuts from Longbridge and were built and painted and cars produced there. 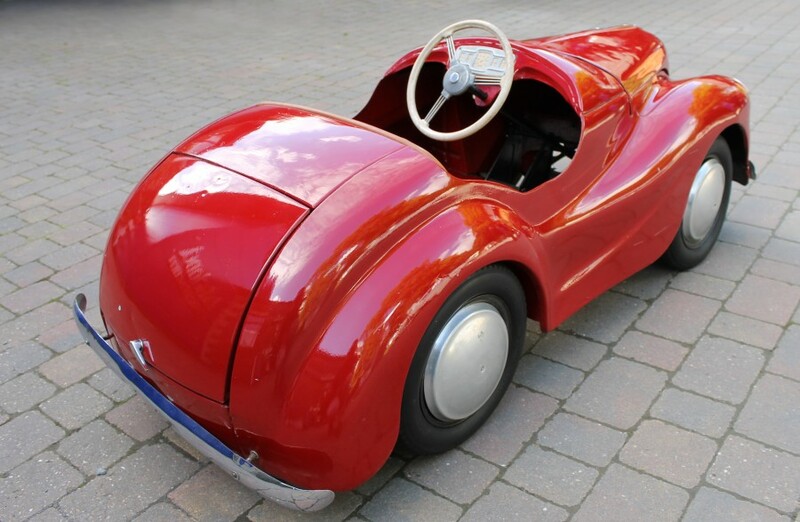 They were a quality, well-equipped toy and probably the best pedal cars on the market featuring working headlight and horn, detachable wheels with Dunlop pneumatic tyres, fascia panel and false engine with real sparking plugs. They had an opening bonnet and boot and plenty of good quality chrome on bumpers, hub caps etc. The J40 sold well and 32,098 were built until production stopped in 1971.